The nematodes or roundworms are one of the most diverse of all animals with over 28,000 species known (although it is believed that there may be more than 100,000 species) of which over 16,000 are parasitic. They are found in all habitats, from marine to freshwater, from the polar regions to the tropics, as well as the highest to the lowest of elevations. They are very common in freshwater, marine and terrestrial environments, where they often outnumber other animals in both individual and species counts, and are found in locations as diverse as mountains, deserts and oceanic trenches. They represent about 90% of all life on the seafloor of the Earth. • Muscles in the body wall run in a longitudinal direction only. Nematodes are slender, worm-like animals, typically less than 2.5 millimetres long. The smallest nematodes are microscopic, while free-living species can reach as much as 5 centimetres and some parasitic species are larger still. The body is often decorated with ridges, rings, warts, bristles or other distinctive structures. The head of a nematode is relatively distinctive. Whereas the rest of the body is bilaterally symmetrical, the head is radially symmetrical, with sensory bristles and, in many cases, solid head-shields radiating outwards around the mouth. The mouth has either three or six lips, which often contain a series of teeth on their inner edge. An adhesive gland is often found at the tip of the tail. 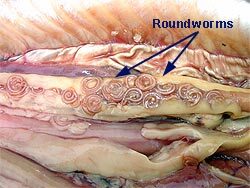 Parasitic roundworms in the body cavity of a fish.